News is filtering through from Aggborough that crowd favourite Iyseden Christie has turned down the new contract offered to him and has now decided to join Stevenage Borough. It has been a source of worry for most fans ever since the end of the season that Christie was stalling over his new contract, thought to have been for just one season, and wanted an extra confirmed year added on. The board, and Mark Yates, didn't want this and just gave him the option of a second year. The outcome now is that arguably our best player is now going to leave the club. Ironically Michael McGrath was given a two year contract during last season and he is not fit to wipe Christie's boots. This now leaves us with just one recognised striker on our books with Justin Richards set to lead the line from now on. Another player that has failed to impress. 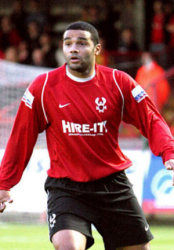 Christie first joined the Harriers in September 2004 and scored thirteen times in the one season that he was first here. He then joined Rochdale in a deal that also saw Mark Jackson travel North with him but it was an un-happy time there for both players with Jackson breaking a leg in his first game and Christie blowing more cold than hot in the twenty games he played for them. He scored just twice at Spotland. He returned to us on loan in August 2006 and joined permanently in the New Year 2007. By the end of last season he had played a total of 149 games for us and scored 53 times. He struggled to get in the side at the start of last season when put alongside either Richards or James Constable but once he was played with Darryl Knights and Matt Barnes-Homer his talents flourished and he ended the season as our top scorer and the fans were looking for more of the same next season. Sadly he has now rejected the clubs offers and will now be joining free spending Stevenage Borough. Boro will now be free to release their top scorer Steve Morison for a large fee and we are left with egg on our face once more.